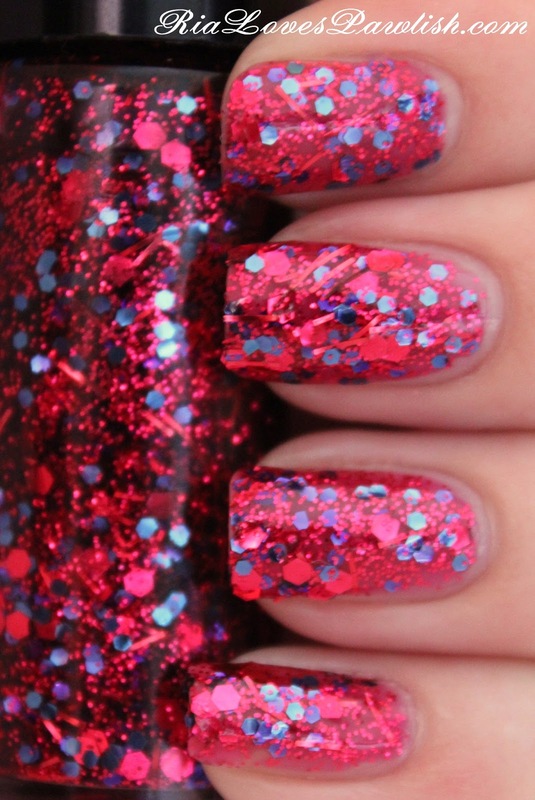 today we have the last Hard Candy polish i received for review, Fireworks from their Crystal Confetti collection! it has loads of different sized and shaped red glitter pieces (including bar!) and medium sized blue hex pieces. this is all in a sheer, jelly-like reddish pink base. this is one of those polishes that sometimes looks completely red, and others it's clearly pink! because there is so much going on in this polish, i think you will be happy with the coverage at two coats... i was. if you really, really examine you might see some VNL, but it's difficult because all the different elements distract the eye. it goes on pretty easy with minimal need for placing... the biggest issue would be to make sure there aren't any pieces that are hanging off your nail tip... they are quite scratchy. this can easily be solved by gently pushing back at the polish while it's still tacky, but not extremely wet. i would add topcoat to make sure everything is smooth and make it all super shiny! 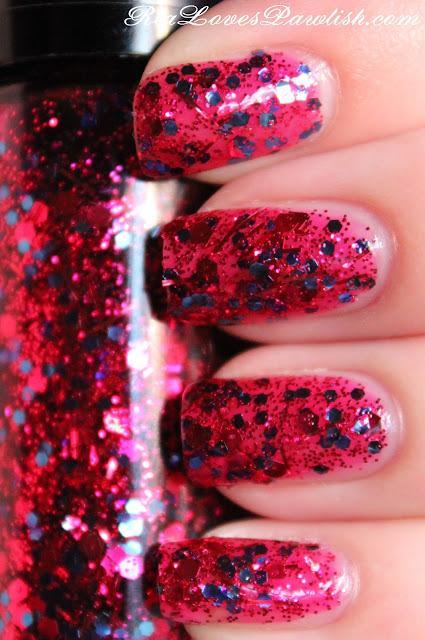 two coats Fireworks, one coat Seche Vite. in this bright light you can really see how jelly-like the base is! i hope you've enjoyed seeing these polishes, i've certainly enjoyed wearing them! a big thank you to the people at Hard Candy!